A couple weeks ago, I had put beef tacos and chorizo stuffed poblano peppers on my menu for the week. I had picked up a pound of ground sirloin, and a half pound of Mexican chorizo – and then when it came time to make dinner one night, neither of those options sounded particularly appealing. 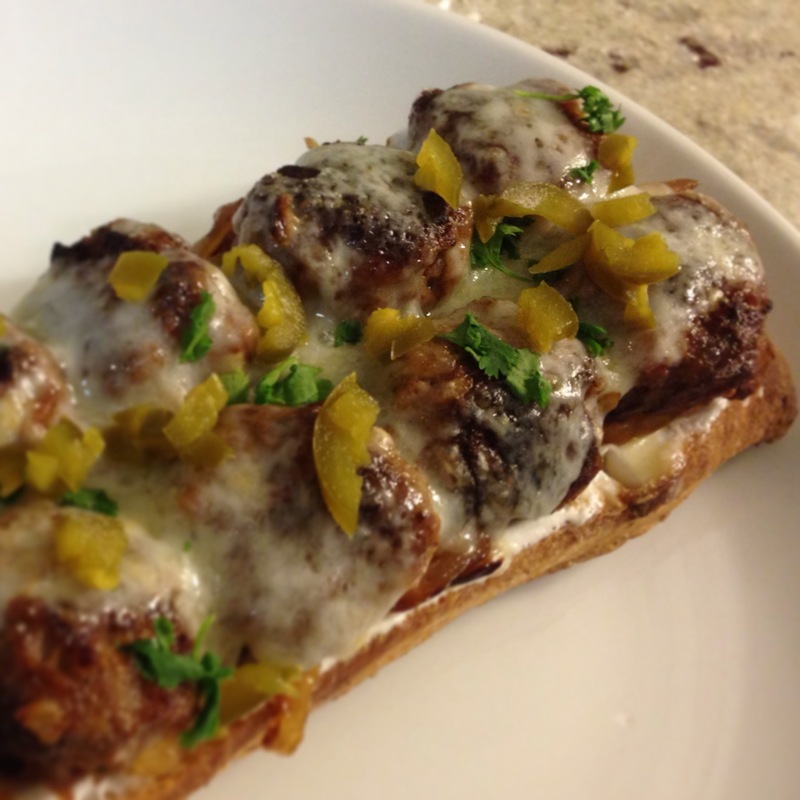 So, rather than order a pizza, or eat a random plate of snacks for dinner, I decided to come up with something new… and Mexican Meatball Subs were born! These subs are a nice change from traditional Mexican fare (tacos, enchiladas, and the like), and also an interesting riff on something that’s traditionally Italian (the meatball sub). Overall, they were a refreshing change to our typical weeknight meals! 1.) 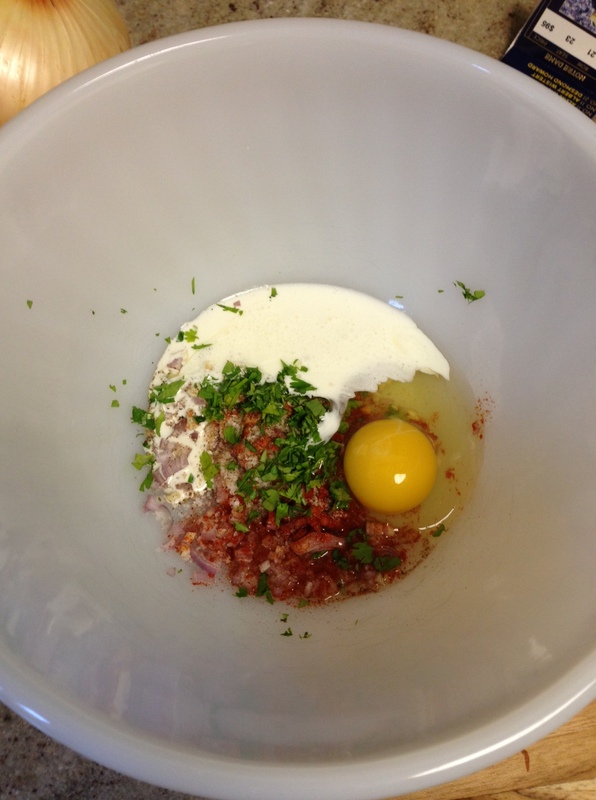 In a large mixing bowl, whisk together the shallot, garlic, cilantro, salt, pepper, smoked paprika, heavy cream, and egg. Make sure everything is well-combined. 2.) Add the beef and chorizo to the bowl, breaking it up as you add it in. Use your hands to gently combine the meats with the shallot and garlic mixture; make sure everything is evenly distributed, but be careful not to overwork the meat! 3.) 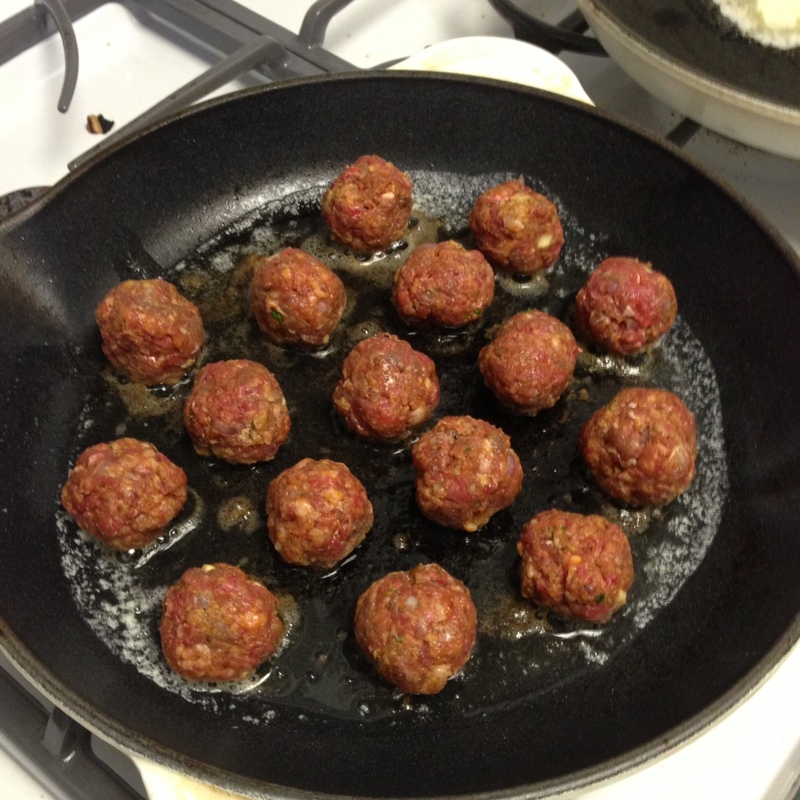 Use your hands to roll meatballs, aiming to make them about 1.5″ in diameter. You should end up with about 25-30 meatballs. 4.) Heat two large skillets over medium heat. Add about one tablespoon each of olive oil and butter to each skillet. In one, place your meatballs (making sure to give them some space – you’ll probably need to cook them in two separate batches), and in the other, saute your onions. 5.) Cook the meatballs for about 10-12 minutes total, flipping 3 times. Tent the pan with foil in between flips, so the meatballs will cook through more evenly. Continually stir your onions in the other skillet, until they are golden brown and caramelized. 6.) 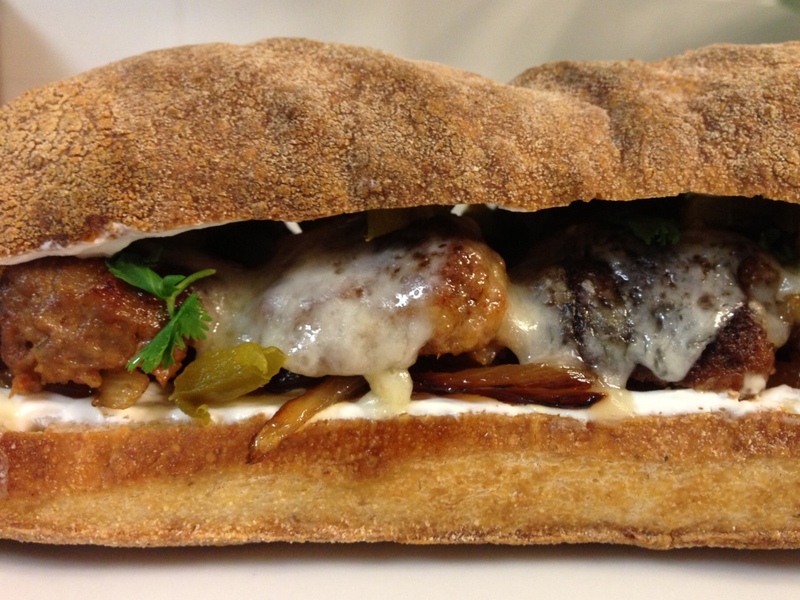 Once your meatballs are cooked and your onions are caramelized, it’s time to assemble your subs! Spread your sour cream or greek yogurt on to the bottom half of the bun or roll; top with caramelized onions, then halved meatballs, and then shredded cheese. 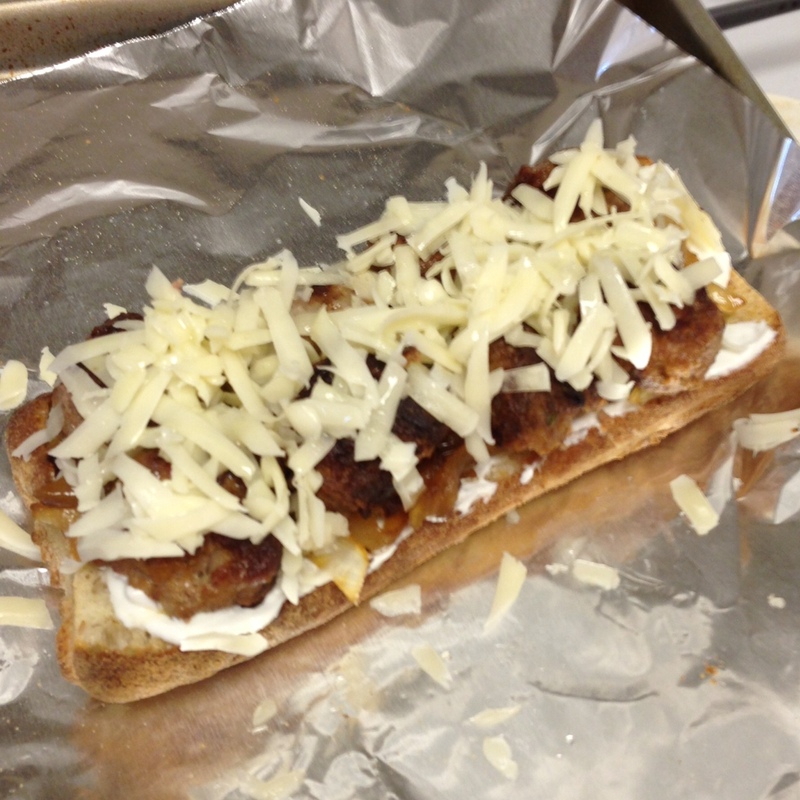 Pop the subs under a broiler set to high for 1-2 minutes, until the cheese is melted and browned. 7.) Remove the subs from the broiler, sprinkle them with the cilantro and jalapeños, and top with the top half of your bun. Serve immediately. *Just a side note: to reduce your standing-over-the-stove time, you could absolutely make these meatballs a little bigger, quickly pan-sear them on 2 sides, and then bake them (in a covered baking dish) for about 15 minutes at 350°. The main reason I cooked them entirely on the stove top is because until about 3 days ago, I had not had a working oven for 2 months, so I had to get a little creative to make certain dishes work out! These meatball subs were delicious. The combination of the beef and chorizo was great – lots of spice, and a bit of a kick, from the chorizo, which really livened the meatballs up. The pickled jalapeños add a great crunch, and a little bit of acid, which cuts through the richness of the meat and cheese. I think the next time I make these meatballs, I’ll definitely be making them as an appetizer. I’ll either make slightly bigger meatballs, and serve them as sliders – or slightly smaller meatballs, and serve them on toothpicks (with a pickled jalapeño slice skewered on top of the meatball). You could also form the meat mixture into burger patties, and throw them on the grill. Any which way, I think they’d be a hit! This burger was the result of another random moment of inspiration. I was at Trader Joe’s, and I picked up a jar of their Hot and Sweet Pepper Jelly – I like to keep a few jars in the house, because that + a block of cream cheese + some crackers is the easiest appetizer of all time (handy when you have unexpected guests on their way). As I wandered the store, I remembered that I had 2 pounds of ground beef thawing in my fridge, and I started to think that putting that pepper jelly on a burger might be awfully delicious. I didn’t think cream cheese would hold up well on top of the burger, but brie seemed like it could be a good fit, so I picked up a wedge of that. And then, because every burger needs a crispy component, I grabbed some prosciutto, thinking I would crisp it up and use it instead of bacon. Once all the components laid themselves out in my head, I practically raced home from the store to get started! 1.) Allow your ground beef to sit at room temp for about 20 minutes, to take the chill off of it. 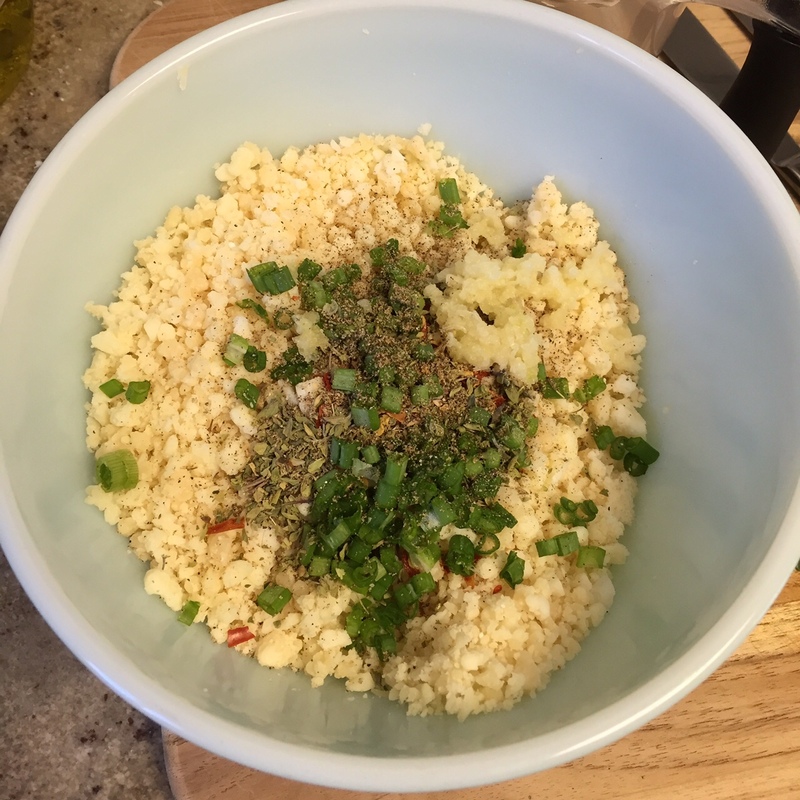 Once it’s warmed up a bit, add it to a large mixing bowl with the salt, pepper, dijon, worcestershire, and garlic. 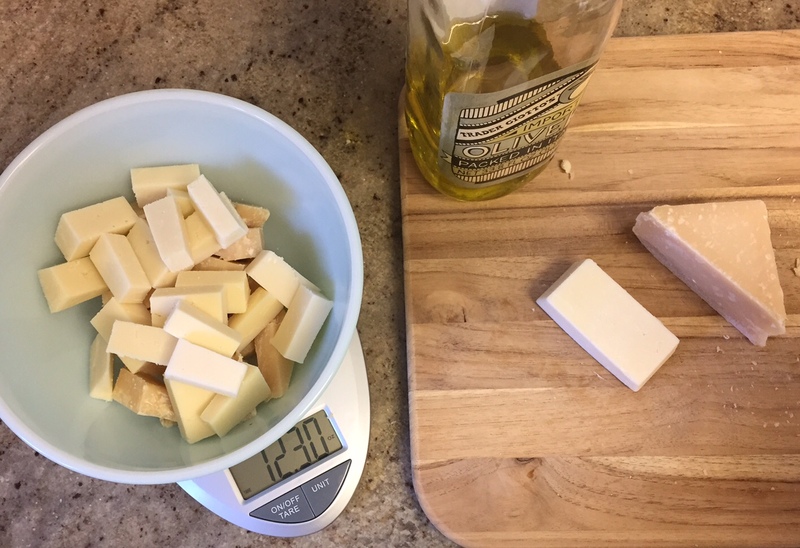 Take 3 slices of prosciutto, and dice them up into 1/4″ pieces, and add them to the bowl. Gently combine all the ingredients with your hands, being careful not to overmix. Shape the mixture into 4 equal patties. 2.) Preheat your oven to 375°. Lay 5 pieces of prosciutto out in a single layer on a rimmed baking sheet; when the oven has heated, bake them for about 10 minutes, until crispy. Set aside one piece for snacking (what? You know you were going to do it anyway), and use the remaining four to top your burgers. 3.) Meanwhile, preheat a grill pan or heavy skillet (or your grill) over medium heat. Lightly oil the pan, and cook the burgers for about 5 minutes on the first side. Flip, and allow them to cook for about 3 minutes. 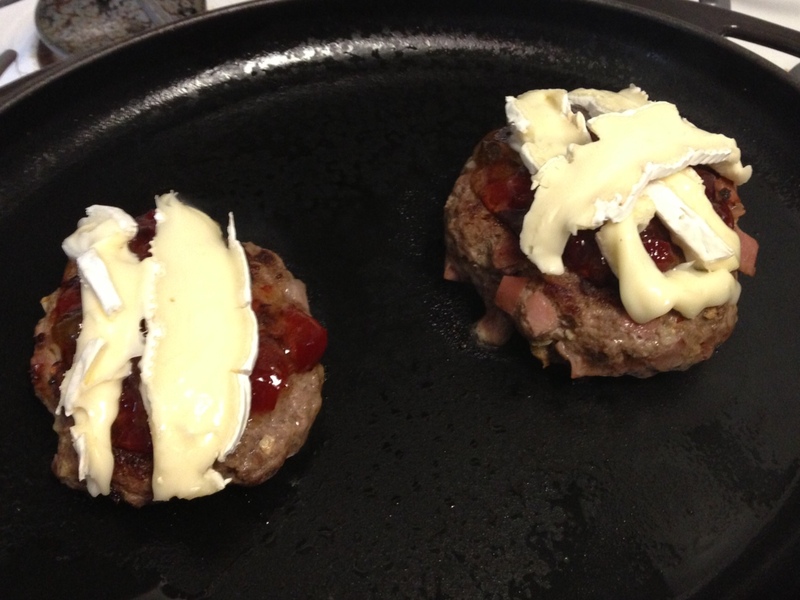 At this point, spoon about 1/2 a tablespoon of pepper jelly on top of each burger, and cover with a few thin slices of brie. Tent a piece of foil over the pan, and let the burgers cook for about 90 seconds more, until the cheese gets melty. 4.) While the burgers finish cooking, toast your hamburger buns and spread the bottom of each with another 1/2 tablespoon of pepper jelly. 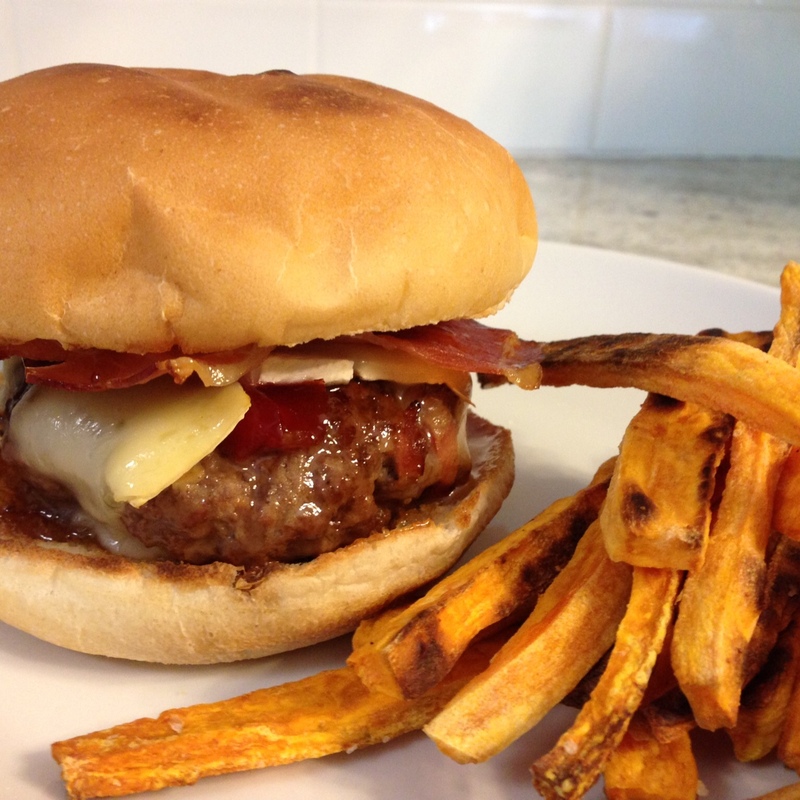 When the patties are cooked, add one to each bun, and top with a slice of crispy prosciutto. Serve with a side of your choice! 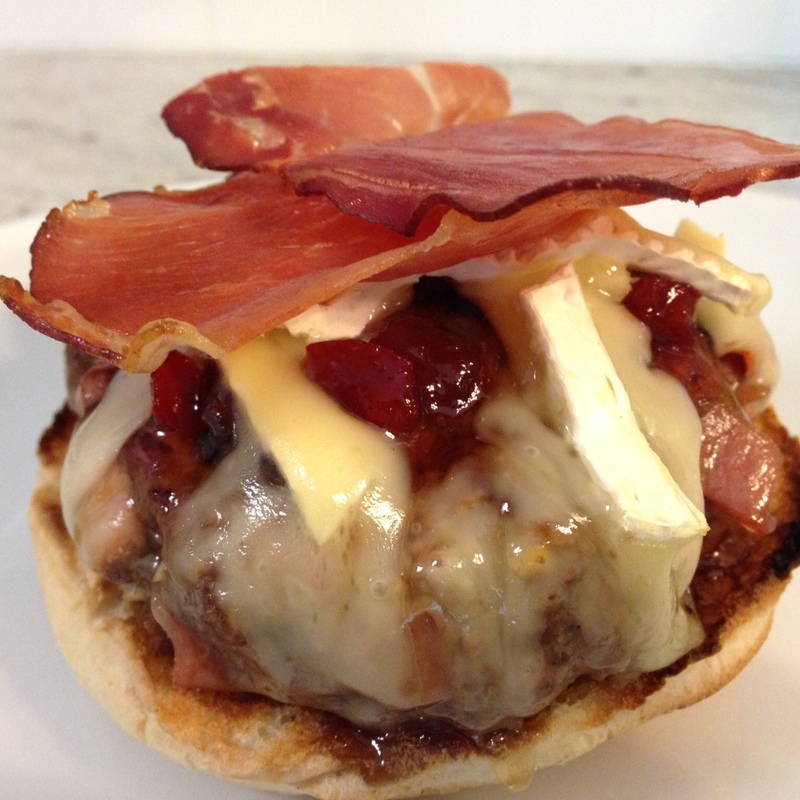 This was another burger success in our household – some slightly sweet, creamy brie, salty and crispy prosciutto, and spicy pepper jelly. Quite a delicious combination! I’m sure these toppings would also be delicious on a turkey burger, or with bacon instead of prosciutto, if that’s what you have in the house. 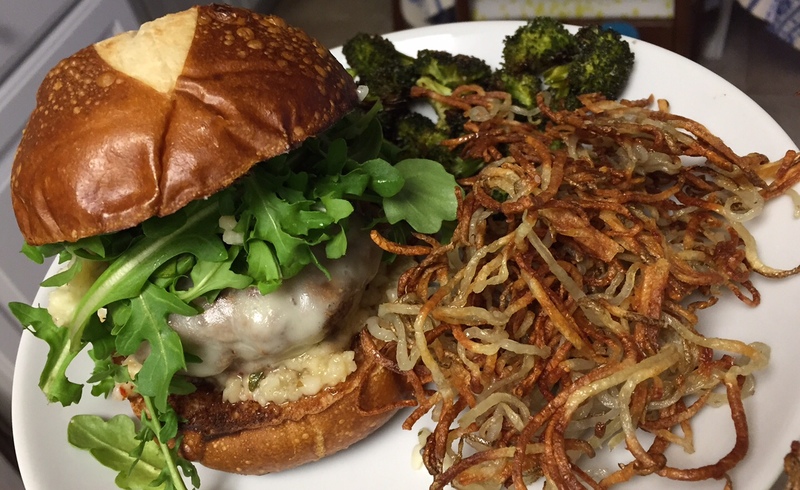 Next time, I might try skipping the brie, and stuffing a cube of cream cheese into the center of the burger instead; it will be fun to see what other variations I can dream up! I’ve been thinking about this particular burger recipe for a while now. 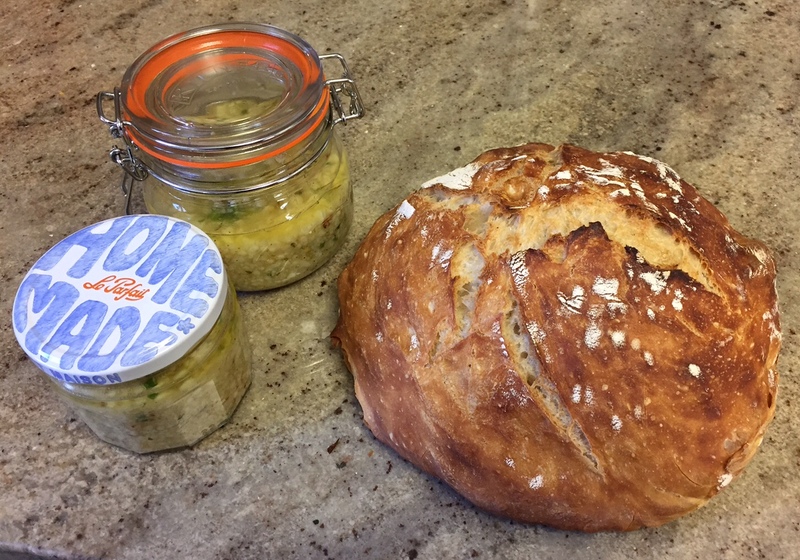 You see, I have this habit of dreaming up ideas for recipes I want to write and test at odd times (when I’m trying to fall asleep, when I’m sitting in traffic, when I’m switching out loads of laundry… I think about food a lot, okay?? )… so, I keep an ongoing note on my phone, where I write out brief descriptions of my ideas, so I won’t forget them! When I am feeling uninspired, and need to do some meal planning, I open the note and pick one of the ideas to work on that week… and then I get to cooking! 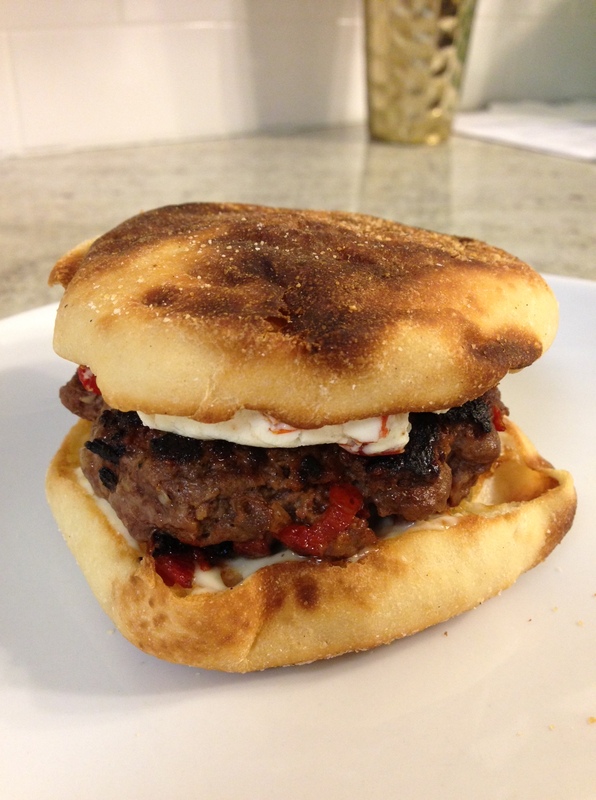 Some random afternoon a while back, I decided that I needed to make a burger with sundried tomatoes and goat cheese, and last week, I did just that. And it was very, very good. 1.) To make the mayo, start by roasting your whole head of garlic. Cut the top 1/3 of the bulb off, and place in the center of a square of foil; drizzle with 2 teaspoons of olive oil, and tightly pinch the foil closed. Place in a small ovenproof dish, and roast at 400° for about 40 minutes. 2.) When the garlic is roasted and cooled, squeeze the cloves from their skins. 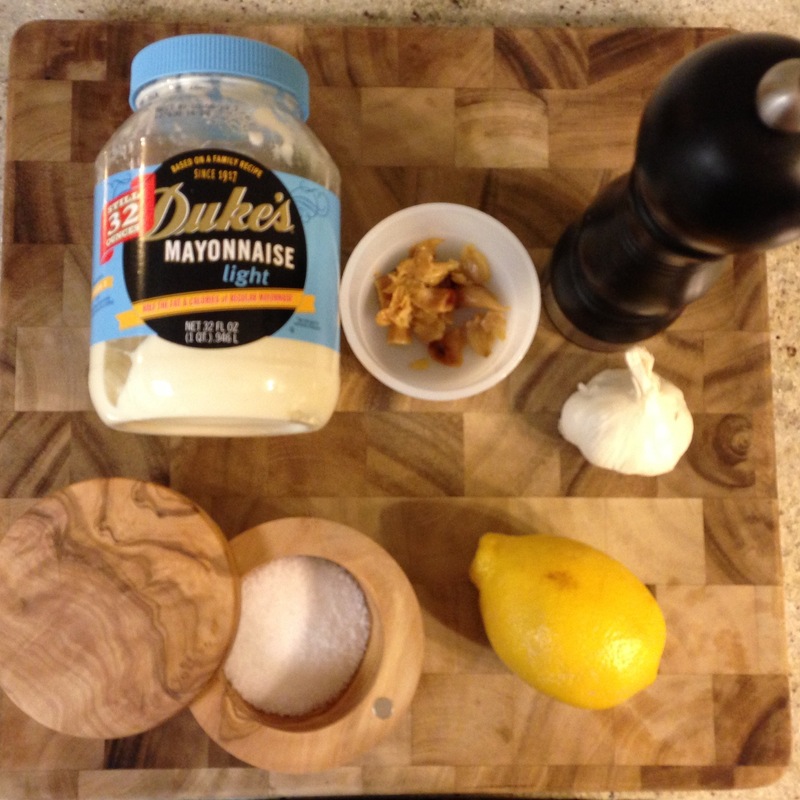 Add the roasted garlic, and all the other mayo ingredients, to a blender, and blend until smooth and creamy. 3.) To make the burgers, place your ground beef into a large mixing bowl. 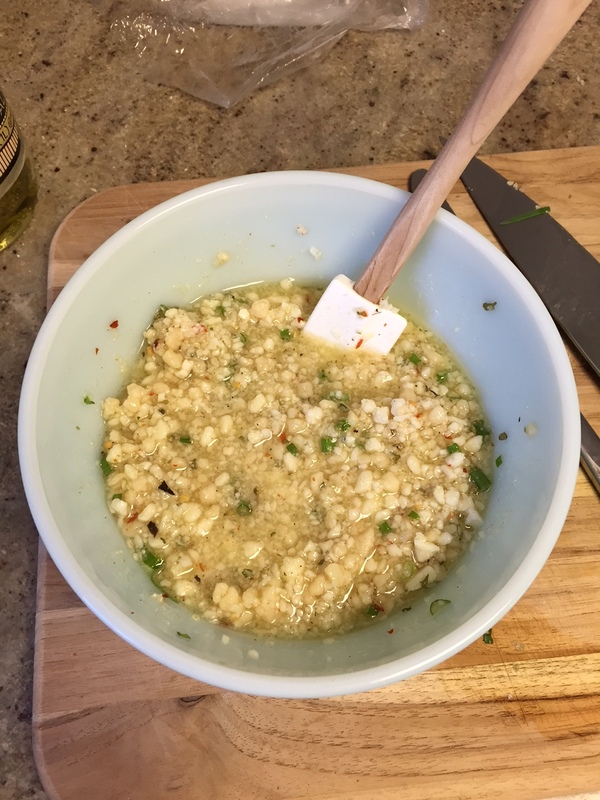 Add the shallot, garlic, dijon, worcestershire, salt, pepper, and half the sundried tomatoes, and mix with your hands until everything is well combined. Be careful not to overmix! Shape into 4 equally sized patties. 4.) Heat a griddle or skillet over medium heat, and lightly spray with oil. When the pan is hot, add your burger, and cook for about 5 minutes on the first side. 5.) While the burgers cook on the first side, add your softened goat cheese, the second 1/4 cup of chopped sundried tomatoes, and a couple grinds of black pepper to a small bowl; use a rubber spatula to combine everything well. 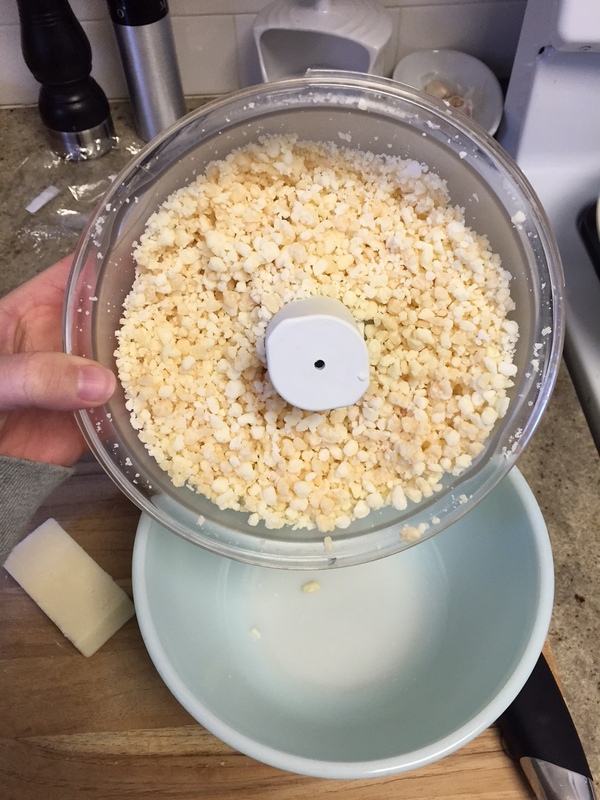 Shape the goat cheese mixture into 4 equal sized disks. 7.) While your burgers finish cooking, spread both sides of your hamburger buns with the roasted garlic mayo. When the burgers are ready, load them on to the buns, and enjoy! 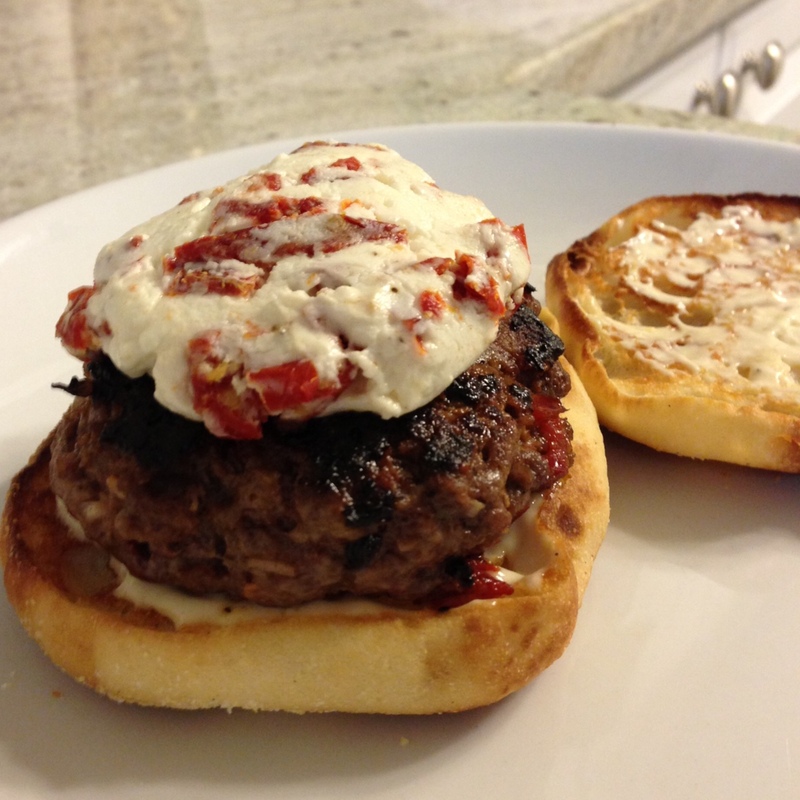 I really, really loved the combination of the tangy goat cheese, and the chewy, sweet sundried tomatoes in this burger. It was such a different, refreshing flavor combination, and it somehow kept the burgers feeling light, which doesn’t happen often with a burger! Definitely a combination I’ll be using often in the future.